Here’s the point I want to make this morning. I’ll just name it up front, in case you are feeling sleepy later or I start to wander. I believe that cultivating compassion is our primary task as a religious community – the work from which all else in this congregation’s mission flows. …cultivating compassion, in ourselves and in this congregation first of all, so that we will be able to cultivate compassion in the wider community that is our home. Let’s take a little time right now to warm up by cultivating our loving-kindness, our friendliness, through the Metta meditation that we just sang and that many of you know so well. This morning I offer the form used by the Humanist Mindfulness Group at the Humanist Community at Harvard. It’s described by Rick Heller in his book, Secular Meditation, and it is rooted in Sharon Salzburg’s work from the 90’s, with a couple twists that I find helpful. The traditional Metta meditation begins with I – “May I be filled with loving kindness,” or in this case, “May I be safe.” Rick Heller notes that for many in American culture it is easier to feel compassion for others first, especially someone we feel good about. Once we’ve surfaced the feeling of compassion and released oxytocin in our system, we remain in that mode for about 20 minutes, so while we are still in the glow of that compassion for someone else, we can more successfully turn compassion toward ourselves. So this meditation begins with focus on another person and then turns to ourselves. There are benefits and hazards to this language, but I invite you to try it on this morning. to sit comfortably upright and tall. You might close your eyes, or lower your eyelids and hold a soft gaze, eyes open but not really focusing. Receive a few deep breaths. Let ease or relax whatever in your body needs to ease or elax. I’d like (you) to be safe. I’d like (you) to be healthy. I’d like (you) to be happy. A Benefactor – a living person who has done something wonderfully good for you, and about whom you feel warmth and appreciation. A Neutral Person – someone who you see but who you do not know. A Difficult Person – not the most difficult person in your life, perhaps not a political figure, rather someone who bugs you a little, who rubs you the wrong way a little. Loving-kindness, cultivated by practice. Not by wishful thinking, but by practices that change how we see one another, and how we feel, so that we are more likely to behave in kind and loving ways. Practices that teach us to be ready, in the moment it is needed, to feel some variation of “I’d like you to be safe, healthy, happy, at ease in the world.” And to act accordingly. Compassion begins with loving kindness, but moves beyond loving-kindness to notice and to care about the suffering of others, until it becomes a desire to help free people from their suffering. voices of suffering fill the wide sky. The message is that we first have to heed the cry – hear, see, notice with our own vulnerable openness that someone is suffering. Not only people far away and in dire circumstances, but the familiar person next to us, across the table, living next door, the person whose behavior irks us at the meeting. And then, having heard the cry, however disguised or silent, we let our wisest, most open-hearted empathy move us to want to relieve that suffering. I heard once that compassion is the natural result of paying attention. The message is that compassion calls us to more than thoughts, prayers, meditations and feelings. Compassion calls us to act to relieve suffering. I’ve shown this photo of Avalokitesvara before. Avalokitesvara has a number of names and takes a number of gender-fluid forms. 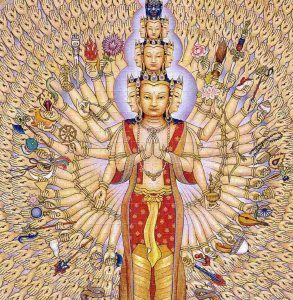 Here Avalokitesvara is portrayed with one thousand arms, an eye of wisdom in the palm of each hand ready to see with honesty and clarity the reality of the world, including the suffering. And in each hand a different tool for relieving suffering. Avalokitesvara is beloved as a divine resource (we all want our cries of suffering to be heard), and also held as an exemplar, an ideal for us. Modern studies are affirming what Buddhism has understood for thousands of years, that being compassionate benefits us, is in fact the central path to happiness. Our empathy and skillful desire to lessen the suffering we find enhances neural integration, strengthens our immune system, increases longevity, decreases stress, and reduces the markers of inflammation. Compassion accomplishes what religion is meant to accomplish: it ties our well-being to the well-being of others and helps us work toward both at the same time. Compassion is the reason and the way to use our intellectual strength. Compassion is our grounding for seeking sustainability and justice in the world, natural outcomes of well-developed and healthy compassion. I’ve been struggling with where best to place my energies and where to encourage your energy and attention in the life of this community. There’s social justice, and pastoral care, and education for young people and adults and outreach to the community, and Sunday services and the building and grounds and…. What’s become clear to me is that the more successfully we can cultivate compassion in ourselves and in this congregation first of all (and then in our community), the more successfully we will be able to live the mission you’ve set for yourselves. All of it. So for me, compassion is the foundation. The place to start. And without compassion as a foundation, the rest is ungrounded. For me, personally, unless compassion is the foundation, the rest becomes enervating/draining. I’m finally becoming more clear about this after 55 years in the world, 44 years working in religious communities, and 2 years of ministry with you. For me the initial questions are: “Are we here treating one another with loving-kindness, respect, compassion, and are we helping each other to do so. Are we able to really see one another, clearly, as gifted and flawed human beings, recognizing each other’s suffering, even when it’s disguised, and moved to lessen that suffering. “It is persistent, holy, world-transforming work”. This is not to claim that I am an expert in or a guru of compassion. This is a sermon to myself at least as much as it may be to anyone else. I am, rather, a fledgling devotee, aspiring to compassionate living and leadership, a student of those here who already offer such compassion. I expect that some people in the room may be worried that compassion is too soft an anchor, in general and in these particular times, worried that compassion is too passive. I offer you Joan Halifax’s reminder of the Buddhist insight that compassion requires both a strong back and a soft front…a thread we’ll pick up next week. The first Sunday of this month we focused on seeing our personal vocations and ministries by looking at our lives honestly and clearly. Last Sunday we framed this congregation’s journey in the larger unfolding epic of evolution and invited some of your visions for this congregation as it lives its mission into the future. Joanne and Ken Harris transcribed all those sticky notes from last Sunday, (thank you) watch for the results in this week’s e-Chalice. Many of you named love and justice, or in one way or another named compassion as a goal. Plus you named a bigger, younger, more diverse congregation … in a larger building. and next Sunday we’ll envision extending compassion outward to a focus on justice. The many other things that need to be said and understood and experienced and teased out about genuine and healthy compassion will be part of our ongoing work. To close today, I offer the insight and invitation of one of the teachers of compassion that I have been studying, who said that one helpful aid in the practice of compassion – is to have reminders everywhere of the importance of love and compassion. Let’s together place reminders of the centrality of love and compassion everywhere in our life together – on our walls, in our newsletters, in our gatherings, covenants, and emails, in our one-on-one conversations, and most of all in our own hearts. Through what we do and what we say, may we ourselves be reminders to one another of the primacy of love and compassion in our life together. Heller, Rick. Secular Meditation: 32 Practices for Cultivating Inner Peace, Compassion, and Joy., 2015. Ladner, Lorne. The Lost Art of Compassion: Discovering the Practice of Happiness in the Meeting of Buddhism and Psychology. New York, NY: HarperSanFrancisco, 2004. Leighton, Taigen D. Faces of Compassion: Classic Bodhisattva Archetypes and Their Modern Expression-an Introduction to Mahayana Buddhism. Boston: Wisdom Publications, 2012.